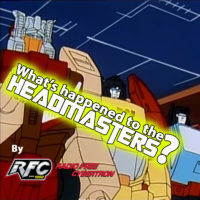 On this episode of What’s Happened to the Headmasters, I’m joined by my friends Ricky and Chris! On today’s episode, we talk about ‘The Shadow of Evil’! On episode four of What’s Happened to the Headmasters, I’m joined by Dusty Camburides the host of RPG Lessons Learned! On today’s episode we talk about the episodes ‘The Evil Meteor’ and ‘Four Million Years — The Veil of Mystery’! What’s Happened to the Headmasters Episode 3 – Water puts out fire, but what will put out the fire in my heart? On the second episode of What’s Happened to the Headmasters, I’m joined by Mike, one the co-hosts of RPG Lessons Learned. Today we talk about the second two episodes of The Headmasters. These are viewed through the lens of the Omni Productions dub, which is basically the meaning of life.